The book's dedication could be expanded to include Baruch Goldstein. Isn't he a criminal? For one, aren't Bonnie and Clyde criminals, and yet they became popular, almost positive characters. I disagree with Goldstein on technicality, the place. Terrorists do not largely attack synagogues, and he should not shoot in a mosque. An idea behind an eye for an eye is very clear connection between damage and retribution. Had he been shooting in a bus - like the terrorists do - many would find that less objectionable. I love bin Laden! I was telling the Israelisfor years to start reprisals against Saudi oil facilities to stop financing of Wahhabism and Palestinian terrorists. The only one who listens is Osama. Oil corporations are greedy but cowardly. Few attacks will sent them looking for more stable sources - Russian, Central Asian, and American. Without Saudi money, Islamic clerics worldwide will abandon Wahhabism. That will not extinguish terrorism, but will dry its religious support base. Besides, I believe in vengeance. So, hurrah to Osama! Go on against the Saudis! We launched a petition to bomb Iranian nuclear facilities, and what is really odd, the number of news agencies that refuse us coverage because of the violence involved. They have no problem to cover Islamic terrorism or Iraqi insurgency, though. In politically correct societies, media forget that they serve to deliver news, and begin censoring opinions. Done with government censorship, welcome to corporate censorship. Back to the violence, everyone lauds police violently catching violent criminals. Not violence per se is bad, but only initiated violence; we object violence that initiate damages, not violence that mitigates them. "MoveOn built its list by organizing vigils and ads for peace and by then supporting Obama for president; today it operates as a full-time cheerleader supporting Obama’s policy agenda. Some of us saw this unfolding years ago. Others are probably shocked watching their peace candidate escalating a war and sounding so much like the previous administration in his rationale for doing so." Picking up on this in The Nation, John Nichols avers that several antiwar groups are not toeing the Afghanistan-is-a-war-of-necessity line, including Peace Action, United for Peace and Justice, and the American Friends Service Committee, yet there is less to this than meets the eye. Naturally, the Friends, being pacifists, are going to oppose the Afghan "surge" and the provocative incursions into Pakistan: no surprise there. Peace Action is not making a whole lot of noise about this, in spite of the issue’s relative importance. They are confining their opposition to an online petition. As for UFPJ, their alleged opposition to Obama’s war is couched in all kinds of contingencies and ambiguous formulations. Their most recent public pronouncement, calling for local actions against the Af-Pak offensive, praises Obama for "good statements on increasing diplomacy and economic aid to Afghanistan and Pakistan." Really? So far, this "diplomacy" consists of unsuccessfully finagling the Europeans and Canada to increase their "contributions" to the Afghan front – and selling the American people on an escalation of the conflict. Although energized and given a local presence nationwide by a significant pacifist and youth contingent, UFPJ is organizationally dominated by current and former members of the Communist Party, USA, and allied organizations, and you have to remember that Afghanistan is a bit of a sore spot for them. That’s because the Kremlin preceded us in our folly of attempting to tame the wild warrior tribes of the Hindu Kush and was soundly defeated. The Soviet Union did its level best in trying to accomplish what a number of liberal think-tanks with ambitious agendas are today busily concerning themselves with solving the problem of constructing a working central government, centered in Kabul, which would improve the lot of the average Afghan, liberate women from their legally and socially subordinate role, eliminate the drug trade, and provide a minimal amount of security outside the confines of Kabul – in short, the very same goals enunciated by the Bush administration and now the Obama administration. The Kremlin failed miserably in achieving its objectives, and there is little reason to believe the Americans will have better luck. In retrospect, the Soviet decision to invade and create a puppet government propped up by the Red Army was arguably a fatal error, one that delivered the final crushing blow to a system already moribund and brittle enough to break. The domestic consequences inside the Soviet Union – the blowback, if you will – sounded the death knell of the Communist system and revealed the Kremlin’s ramshackle empire in all its military and moral bankruptcy. What is to prevent the U.S. from courting a similar fate, at a time when our economy is melting down and the domestic crisis makes such grandiose "nation-building" schemes seem like bubble-think at its most hubristic? That’s where the pro-war progressive think-tanks come in: their role is to forge a new pro-war consensus, one that commits us to a long-range "nation-building" strategy in Afghanistan and Pakistan. These are the Center for a New American Security, explicitly set up as home base for the "national security Democrats" who make up the party’s hawkish faction; Brookings; and, last but not least, the Center for American Progress, which was an oasis of skepticism when Team Bush was "liberating" Iraq, and a major critic of the occupation. Now the leadership of CAP is making joint appearances with the neocons over at the newly christened Foreign Policy Initiative and issuing lengthy white papers outlining their Ten Year Plan [.pdf] for the military occupation of Afghanistan. Not only that, but they are moving to the front lines in a battle against Obama’s antiwar opponents, with the Nichols piece – which merely reported growing opposition to Obama’s war on the Left – eliciting a testy response from CAP honcho Lawrence Korb and one of his apparatchiks. In it, the CAPsters aver, wearily, that none of this is new – the "schism" within the "progressive community" over Afghanistan is "long-standing" – and they remind their audience that the release of CAP’s latest apologia for occupying Afghanistan is hardly precedent-setting. After all, their two previous reports supported precisely the same position, which was taken up by Obama during the 2008 campaign: Iraq was the wrong war, Afghanistan is the "right" war, and the Bush administration diverted vital resources away from the latter to fight the former. Now that Obama is doing what he said he’d do all along – escalating and extending the Long War on the Afghan front – CAP is supporting him. It’s as simple as that. "Given our organization’s (and our personal) long-standing assertion that a U.S. military withdrawal from the war in Iraq was and is a necessary precondition for Iraq’s competing parties to find a stable power-sharing equilibrium, perhaps it comes as a surprise to some that we would ‘now’ call for such a renewed U.S. military, economic, and political commitment to the war in Afghanistan." Well, yes, now that you mention it, this cheerleading for Obama’s war is a bit of a turnaround for CAP and the Washington "progressive" community. Their Stalinesque about-face – which recalls the disciplined hypocrisy of Communist cadre who were just as fervently antiwar in the moments before Hitler invaded Russia as they were pro-war every moment since – requires some explanation. Korb, however, is not very forthcoming. He does little to refute objections to the occupation of Afghanistan, which would seem to reflect the very same critique leveled at Bush’s conquest of Iraq. Yet we get relatively little out of him, except the bland assertion that "Afghanistan is not Iraq." Not convinced yet? Well then, listen to this: "Unlike the war in Iraq, which was always a war of choice, Afghanistan was and still is a war of necessity." There, that ought to quiet any qualms about embarking on a 10-year or more military occupation and a hideously expensive "nation-building" effort in a country that has defied would-be occupiers for most of its history. "Al-Qaeda poses a clear and present danger to American interests and its allies throughout the world and must be dealt with by using all the instruments in our national security arsenal in an integrated manner. The terrorist organization’s deep historical roots in Afghanistan and its neighbor Pakistan place it at the center of an ‘arc of instability’ through South and Central Asia and the greater Middle East that requires a sustained international response." 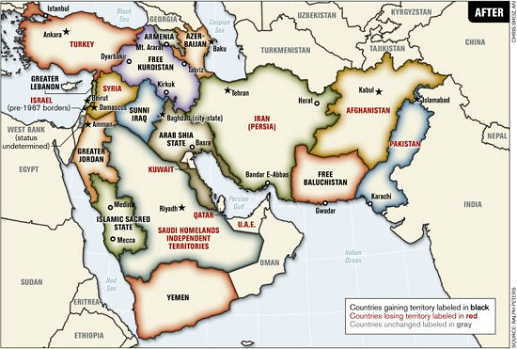 If al-Qaeda has "deep historical roots" in Afghanistan and Pakistan, then they run far deeper in, say, Saudi Arabia – where most of the 9/11 hijackers were from. If we go by Korbian logic, that merits a U.S. invasion and decade-long military occupation of the Kingdom. Is it something in the water in Washington, or is it just the water-cooler in CAP’s D.C. offices? Yes, by all means, let us examine the "deep historical roots" of al-Qaeda, which originated in what Korb obliquely refers to as "the anti-Soviet campaign." This campaign was conducted by the U.S. government, which armed, aided, and gave open political support to the Afghan "mujahedin," who were feted at the Reagan White House. Supplied with Stinger missiles and other weaponry, which enabled them to drive the Red Army out, al-Qaeda developed as an international jihadist network in the course of this struggle, which later turned on its principal sponsor and enabler. None of this, of course, is mentioned by the authors of the CAP report. Shorn of sanctimony and partisan rhetoric, what the advocates of Obama’s war are saying is that Afghanistan and Pakistan are Osama bin Laden’s home turf, and the 9/11 terrorist attacks give us the right to militarily occupy the country, in perpetuity if necessary, in order to prevent a repeat. This argument lacks all proportion and belies the Obamaites’ appeals to "pragmatism" and "realism" as the alleged hallmarks of the new administration. Beneath the unemotional language of faux-expertise – the technical analyses of troop strength and abstruse discussions of counterinsurgency doctrine – a dark undercurrent of primordialism flows through the "progressive" case for a 10-year war in the wilds of Central Asia. The unspoken but painfully obvious motive for Obama’s war is simply satisfying the desire of the American people for revenge. It is certainly not about preventing another 9/11. The biggest and deadliest terrorist attack in our history was for the most part plotted and carried out here in the U.S., right under the noses of the FBI, the CIA, and all the "anti-terrorist" agencies and initiatives that had been created during the Clinton years. Earlier, it was plotted in Hamburg, Germany, and Malaysia, and the plot advanced further still in a small town in south Florida. Having concluded that another terrorist attack on U.S. soil is for all intents and purposes practically inevitable, the U.S. government during the Bush era decided to take up an offensive strategy, to go after the terrorist leadership in their "safe havens." The Obamaites, likewise disdaining a defensive strategy, have continued this policy, albeit with a simple switch in locations and the application of greater resources. They have furthermore determined – without making public any supporting evidence – that these alleged terrorist sanctuaries are located in Afghanistan and Pakistan. The president has even broadly hinted that Osama bin Laden himself is in Pakistan’s tribal area. One presumes we are supposed to take this on faith: after all, the U.S. government would never lie to us, or exaggerate the known facts – would they? The CAP report is mostly a rehash of liberal interventionist bromides, paeans to multilateralism (which ring particularly hollow in view of Obama’s recent failure to get more than a measly 5,000 European troops out of NATO), and pious pledges to build clinics, schools, and walk little old ladies across crowded streets even as our soulless armies of drones wreak death and devastation. This use of robots to do our dirty work recalls the bombing of the former Yugoslavia, during which American pilots dropped their deadly payloads from a height of 20,000 feet. Sure, it made for somewhat dicey accuracy, but better Serbian "collateral damage" than American casualties. The same lesson applies to the Af-Pak war: better a lot of dead Pakistanis than a few downed American pilots. The U.S. death toll is already rising rapidly enough, and the shooting down of an American pilot over Pakistani territory would surely draw unwelcome attention on the home front, as well as cause an international incident. We can’t have that. I am truly at a loss to describe, in suitably pungent terms, the contempt in which I hold the "progressive" wing of the War Party, which is now enjoying its moment in the sun. These people have no principles: it’s all about power at the court of King Obama, and these court policy wonks are good for nothing but apologias for the king’s wars. They are, however, good for an occasional laugh. I had to guffaw when I read the phrase "arc of instability." This is supposed to be a reason – nay, the reason – for a military and political campaign scheduled to continue for at least the next 10 years. Well, then, let’s take a good look at this "arc," which, we are told, extends "through South and Central Asia and the greater Middle East." From the shores of Lebanon to the mountain ranges of Afghanistan, and most places in between, that "arc of instability" defines the geographical extent of U.S. intervention in the region from the end of World War II to the present. If any single factor contributed to the instability permeating this arc, then it is the one constant factor in the equation, which has been the U.S. presence and efforts to dominate the region. What is Korb’s – and CAP’s – solution to the problem of regional instability? Why, more of the same. This will lead, as it has in the past, to more blowback and an increase in the support and capabilities of the worldwide Islamist insurgency we are pledged to defeat. (IsraelNN.com) United States officials have confirmed that Israel Air Force warplanes bombed a truck convoy in Sudan in January. The trucks were carrying arms that would be smuggled into Gaza for use against Israel, the officials said, according to a report in the New York Times. Israel strikes terrorists “in the north and in the south... There's no need to mention details; people can use their imaginations,” Olmert said. The American officials said Israel hit the convoy in order to prevent weapons from reaching Gaza during Operation Cast Lead. The Times describes the sources as two American officials “who are privy to classified intelligence assessments.” The sources said that Iran had been involved in the effort to smuggle weapons to Gaza. According to intelligence reports, they added, an agent for Iran’s Islamic Revolutionary Guards was in Sudan, coordinating the smuggling operation. Iran funds, arms and trains two proxy armies on Israel’s borders: Hizbullah in the north and Hamas in the south. Sudanese officials made news of the strike public on Thursday, when they claimed that “American fighters” bombed a convoy of trucks in eastern Sudan. According to the Times, there was a possibility that the reason Sudan came out with the accusation now, two months after the alleged attack, was that it was reacting to a decision by the International Criminal Court to issue a warrant for the arrest of Sudanese President Omar Hassan al-Bashir, on war-crimes charges. A spokesman for the United States Africa Command said U.S. forces had not attacked in Sudan. “The U.S. military has not conducted any airstrikes, fired any missiles or undertaken any combat operations in or around Sudan since October 2008, when U.S. Africa Command formally became responsible for U.S. military action in Africa,” he said. In just a few short months Maria Sergeyeva has become a controversial political celebrity. But how did the 24-year-old Russian garner such widespread attention, and just how powerful might she become? The U.K.'s Daily Mail writes that she is the "leading propagandist" of Russian Prime Minister Vladimir Putin. Critics believe she is being used by Putin to drum up support from Russia's youth. She's certainly carving out a nice career for herself. Sergeyeva is widely believed to be on her way to a government ministry position. Her ultimate ambition, apparently, is to rule Russia. The Daily Mail goes on to explain that Sergeyeva is "a leading light of the Young Guards, a youthful and growing band of zealots dedicated to resisting any efforts to stop Putin's inexorable Russian revolution." Not exactly a nonpartisan statement, but Sergeyeva isn't exactly nonpartisan herself. The Daily News writes that the rising star has called for immigrants to "go home." She also blasts those who criticize Putin and believes that the United States wants Russia to be "weak." The Kyiv Post compares her to Ann Coulter. While her statements and speeches are debatable, we've noticed that many folks are more intrigued by her looks than her remarks. Searches on her name are up 454% this week, and "maria sergeyeva pictures" are also on the march. Some have labeled her "Putin's pinup," but others believe that focusing on her looks discounts the impact she may have on the world stage.